Leslie Combs, age 68 of Hazard, passed away on Tuesday, November 27, 2018 at St. Joseph Hospital in Lexington, KY. 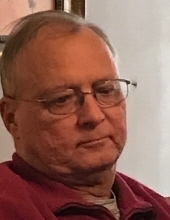 He was a graduate of Hazard High School and the University of Kentucky as well as a retired manager of Teco and the former city manager for the city of Hazard. He was the son of the late Tolbert Combs and the late Aline Ballard Combs. In addition to his parents, he is also preceded in death by two brothers: Larry & Lanny Combs; as well as mother-in-law: Freda Lykins. He is survived by his loving wife of 47 years: Judy Lykins Combs; one daughter: Allison (Kenny) Boggs of Hazard, KY; one sister: Lynda Combs of Hazard, KY; father-in-law: Leo Lykins Sr.; special grandchild: Preston Boggs; two nephews: Roland Combs & Scott Blair; two nieces: Lana Rose & Missy Blair; as well as a host of family and friends. To send flowers or a remembrance gift to the family of Leslie Combs, please visit our Tribute Store. "Email Address" would like to share the life celebration of Leslie Combs. Click on the "link" to go to share a favorite memory or leave a condolence message for the family.